In September, I joined fellow nomads and freelancers in Lisbon for Digital Nomad Conference 2017. 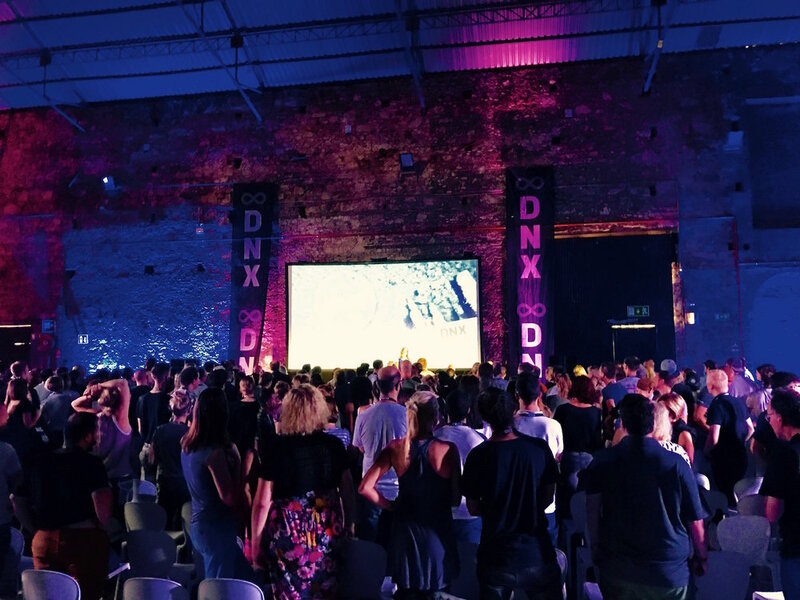 This giant digital nomad-palooza took place over two days and had a lineup of amazing speakers including the founder of Remotive, Rodolphe Dutel, and the man responsible for Estonia’s e-Residency program, Taavi Kotka. Out of the 400+ attendees, I was blown away by the variety of work that can be done while traveling, including everything from teaching art classes to running international yoga camps. Everyone I met had bits of wisdom to share from their time working remotely and I’m excited to tell you about three lessons from the conference. Once you start working remotely, everything becomes a distraction. It takes a lot of willpower not to waste time aimlessly scroll through Instagram liking every dog picture you see. Whenever I arrive in a new place it always takes me a day or two to settle into my work mode. The excitement of being somewhere new and meeting locals often disrupts my usual flow. Tock explained that one way he jumps back into his routine in a new location is by setting up the same workspace wherever he goes. He carries a keyboard, mouse, and laptop stand with him on trips and when he organizes his workspace it allows him to create a sense of familiarity in each location. Admit it, the joke I made earlier about willpower–although super cheesy–is true. We’re constantly being distracted by our smartphones. If you want to maintain any semblance of productivity while traveling you need to eliminate distractions. The best way to do this? Grab your phone right now and put it on Do Not Disturb. If you use Slack or some other chat service for work, turn off notifications when you’re focusing on completing a project. Also, if you find that working in a coworking space or cafe is too distracting, go to a local library–it’s free and quiet! TomatoTimer - Based on the Pomodoro Technique, Tomato Timer helps you break your work into 25-minute sprints. RescueTime - This app runs in the background on your laptop or mobile device and tracks how you spend your time. If you waste too much time on Facebook or reading blogs, you’ll immediately know after seeing your daily dashboard. Vitamin R - If you want to combine both of the apps listed above into one, try Vitamin R. You can list out all your tasks for the day, see which tasks you spend the most time on, and set a timer when you begin working on each new project. Sign up with your email address to receive more resources. This is a spam-free zone. From scheduling meetings to getting paid, international clients can present an interesting challenge for freelancers. If you work with any clients in the EU, but you’re based somewhere else, the Estonia e-Residency program is an option to consider for easing some of these challenges. Taavi Kotka, the CTO of Estonia, explained some of the benefits of the Estonia e-residency program and tips for managing international projects. Looking for a simple remote work hack that will save you time and keep you productive? Well, here it is: change all your meetings to one or two days during a set period of time (For example, you only take calls between 3pm and 6pm on Tuesdays). This way, you don’t have to take meetings every day of the week and disrupt your flow of work. If you were born before the 2000s, you probably remember how difficult it was to get access to music. You had to purchase a CD, vinyl, or cassette tape if you wanted to listen to a specific song. Nowadays, we have streaming services like Spotify and SoundCloud that allow us to listen to any song at any time. The idea of not being able to listen to certain songs because we didn’t have access to them seems like a distant memory. This is basically what the Estonia e-Residency program wants to do for international business. Estonia realized it couldn’t rapidly increase its GDP by incentivizing fertility rates or boosting immigration, so it took a different approach. Instead, the country’s leaders realized they could allow people to do business in Estonia without requiring people to actually be in Estonia. Thus, the e-Residency program was born! Now, you can remotely do business in the EU. This benefits Estonia because they get to collect taxes and it brings more business into the country. Estonia is the first country to kickstart a program like this to increase the GDP of its country, but just like streaming services with music, we’ll probably look back on this as the beginning of a new era of transnational business identities. You can learn more about the program here. Sending or receiving money abroad can be a pain. You’re constantly having to deal with huge fees from banks and currency conversions. If you need to send or receive money through a currency that’s different than your home currency, Transferwise is a better alternative than your standard bank. Why? Well, Transferwise sends money at the exchange rate without the usual fees that banks apply whenever you transfer money internationally. Whenever you send a potential client a scope document for a project, be sure to include an appendix in the back with payment terms. Will there be a penalty fee for rush jobs or revisions? Are you going to ask for payment upfront if it’s a big project? Write these things down so your client knows when they should pay you and what they should expect if they demand more of your time than you agreed to. In addition to your payment terms, you should have a timeline of when you’ll be paid. If you’re doing project-based work this should be easy, but if your projects are a bit more sporadic, outlining a payment deadline before fees incur is important. Here’s an invoicing template you can use when sending payment requests to clients. Thanks for taking the time to read this! I hope you found some of the insights useful and if you have any questions or thoughts about these tips, share them in the comments section.